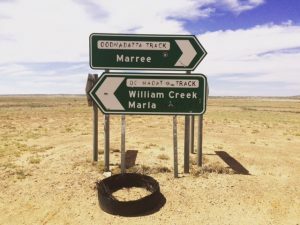 Dr Kelleher and Kellehers Australia have always been closely affiliated with the aboriginal community, particularly the Arabunna People of South Australia. 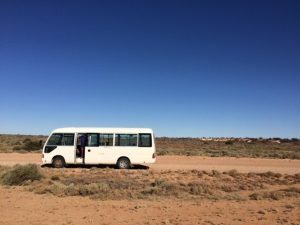 For many years now Kellehers Australia led annual excursions out to Marree. We do probono work for Mr Reg Dodd, Elder for the Marree Arabunna People. Taking in the natural beauty of the country, the beautiful stories of the land, how it began and how the indigenous Arabunna People utilised the land for thousands of years. 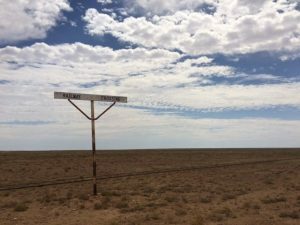 In October 2016 a Kellehers Australia team went up again to Marree. Again we gained further knowledge of enormous cultural and historical significance. We took instructions in several legal matters. 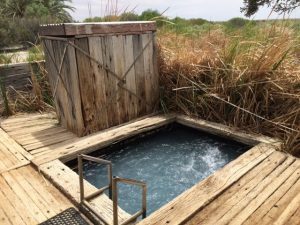 One of the most beautiful sights we had the pleasure of beholding was that of Lake Eyre. 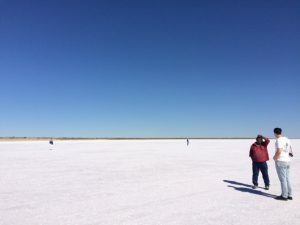 Almost completely dry, the vast salt pan stretched as far as the eye could see in every directions, giving the somewhat out of place impression of fresh snow. The crystals glistening in the afternoon sun, it caused a rare moment of silence from the team as we took stock of the magnificence before us. Those who had seen it full of water recalled the salt stinging their cuts. Hard to imagine as we walked out on the crunchy plain. Small creeks of water could be spotted on occasion, but clearly the lake had not been full for some time. We were delighted to see how earlier cultural heritage work led by Dr Kelleher has come to fruition. 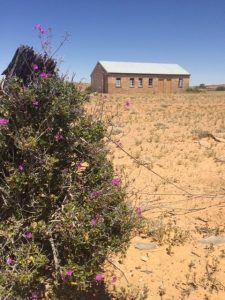 Finniss Springs Mission, with its beautiful historic school building and houses is now substantially restored. It proves a fascinating insight into the lives of those who had trodden the ground previously. Tales of how it was to grow up in the area and the vast cultural changes from there were fascinating to hear within the restored buildings. 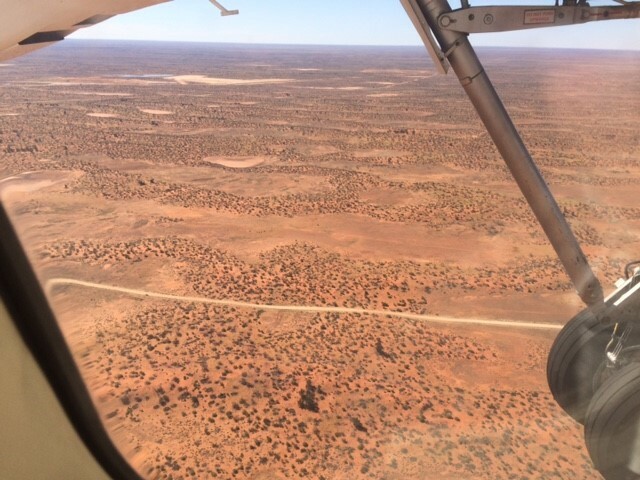 As we rattled over the dusty Borefield Road and Oodnadatta Track, a vision of red glowed on the dry ground. 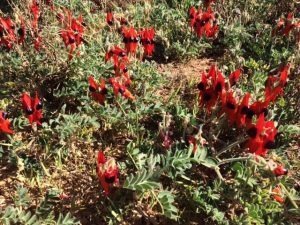 The Sturt Desert Pea, South Australia’s State Flower, was in bloom. This flower (Arabunna Arabunna) gives it’s name to the Arabunna People themselves. Throughout our trip, the incredible amount of beautiful flora in such an arid environment was breathtaking. Vast swathes of intense pink covered the hills and ‘fried egg’ flowers sprouted up everywhere. 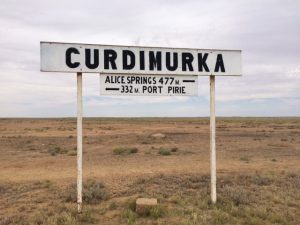 A stop at Curdimurka further North on the Oodnadatta Track showed a stark contrast as to how life has changed in this region over the years. Formally a stop on the Gahn railway, the station now stands empty and quiet. Even the famous ‘Curdimurka Ball’ is a thing of the past. Thousands of city dwellers descend on the area in full ball-gown attire for the annual ‘knees-up’. Not just there to work – the team enjoyed a relaxing afternoon at Coward Springs, soaking in the springs and yarning over cups of billy tea. The evenings spent out in swags under the stars were an experience never to be forgotten. Sitting around the campfire listening to locals speak of the songs of the land whilst gazing up at shooting stars and passing satellites called for reflection amongst us all. The importance of preserving these lands and the history held within their elements is of immense importance and having the honour of spending a few days experiencing the land for ourselves made this resonate deeply amongst us all.